Convinced you can't draw horses? from all walks of life, and there is also private tuition. Drawing horses is an immense challenge, even for the talented. Long breaks from the studio can mean skills going rusty. 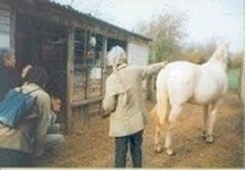 While Sue felt she could paint and sculpt horses, there were few teachers to help with the intricacies of drawing in order to up-skill in these mediums... Without a map and compass how best to chart one’s progress? A system developed after studying horses' natural and extraordinary uninhibited movement, with stepped progression. STARTS The Green Gt Glen - 2 hours of MAGIC! The author is EAA founder and tutor Sue Bird - an Associate Member of the Society of Equestrian Artists. Her two and three dimensional art work may be seen on www.equestrianartists.co.uk - in the SEA Gallery.